The 14th World Congress on IT will take place in Athens, capital of Greece and cradle of western civilization. This coming May, WCIT, the flagship biennial event of the World Information Technology and Services Alliance (WITSA), will be hosted by the Federation of Hellenic Information Technology & Communications Enterprise (SEPE), the Greek WITSA member. This premier global forum attracts senior corporate executives, distinguished academic professors and researchers, government leaders and policy makers whose interaction and decisions shape the future of the ICT world. The Congress will provide a historic opportunity audience of nearly 2000 delegates from over 40 countries. 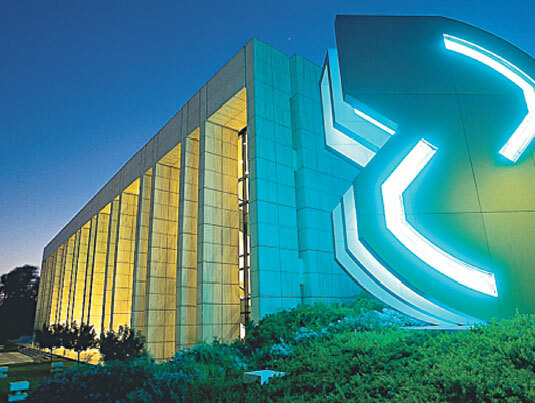 WCIT 2004 will be held in the brand new Convention Centre of Athens Music Hall, from May 19th to May 21st, 2004. 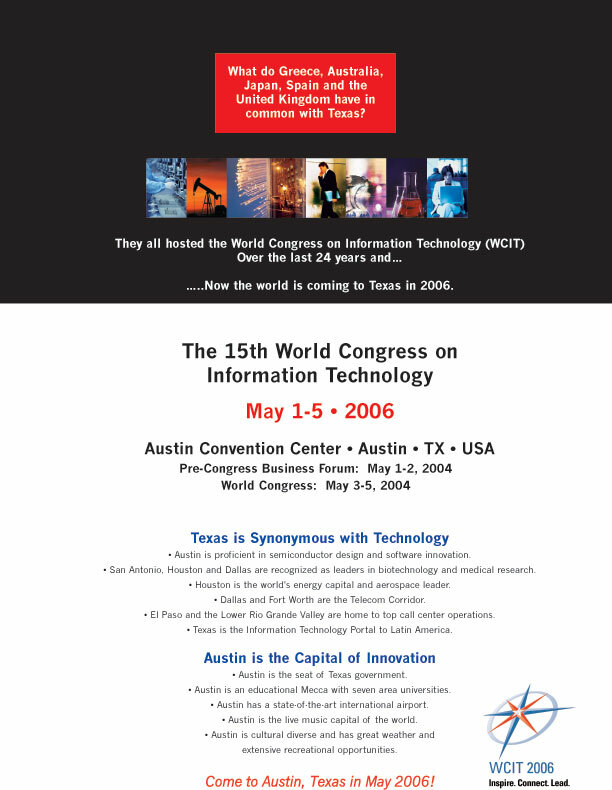 The 14th World Congress on Information Technology (WCIT 2004) is the first WCIT to be hosted in South-Eastern Europe. Situated at the crossroads between East and West, Europe, Africa, the Middle East and Asia, Greece appears as the ideal site for this top international ICT Congress. Associating its laborious intellectual and scientific heritage to the ICT research, creation and marketing, the WCIT 2004 host country bridges ancient and digital culture right in the birthplace of the first computer in history, the Antikythera Mechanism (80 B.C.) Sharing a composite European, Balkan and Mediterranean identity, Greece may also serve as a platform for ICT collaboration among mature western markets and emerging ones in its region. Timing for the event couldn’t be better! Three months after WCIT 2004, Athens is hosting the 2004 Olympic Games. To prepare for this major international athletic and communication event, the Greek capital has undergone significant reconstruction. WCIT 2004 attendees will be the first to enjoy Greece’s Olympic hospitality and experience its newly deployed high-tech infrastructure. The World Congress on Information Technology is considered the most important biennial event in Information and Communication Technology (ICT) sector, attracting leading international key players and decision makers. For over 25 years, eminent academics, researchers, corporate executives and policy makers from all over the world have participated in this event, establishing WCIT as a vehicle for the exploration of new ideas and applications, as well as a forum for daring discussions and decisions that shape the future of the ICT world. This flagship event in the ICT calendar offers its participants the unique opportunity to network at a high level, explore up-to-date information on ICT industry trends and developments, and participate in a forum to discuss and evaluate prevailing ICT industry issues. Europe will host the next WCIT in 2012. The owner of Congress, World Information Technology and Services Alliance (WITSA) is a consortium of 53 information technology (IT) industry associations from economics around the world, representing over 90% of the world IT markets. Highlight Europe’s potential along with the potential of emerging markets in the Balkans, Middle East and the broader Mediterranean region. The endorsement of the “Declaration of Political leaders on Technological Development in the Service of the Citizen” by Ministers of more than 25 countries. Official ‘launching’ of access2democracy, a newly formed non-profit NGO, actively supported by a group of prominent world citizens, access2democracy (a2d), a novel forum which promotes e-democracy and citizens’ access worldwide, will be actively engaged in the ‘e-democracy / e-government’ part of the conference, through a series of significant initiatives which will be announced through WCIT 2004 forthcoming channels of communication. The European Innovation Relay Centre (IRC) network will pre-arrange business meetings of the participants with scores of European Small & Medium Sized Enterprises offering innovative products, services and technologies. The Michael Dertouzos dedication and presentation of the M. Dertouzos awards to students and young researchers. The Michael Dertouzos Awards are open to students and young researchers (up to 32 yrs of age). Candidates are required to write a paper on the subject of “IT with a Human Face”. Upon evaluating the papers of all authors, the Program Committee will announce the top three winners who will have the opportunity to present their work at the Congress. Each one of them will be assigned a 10-minute slot during the last day of the main program; other authors nominated for the Dertouzos Award, will have the opportunity to present their work in the poster area, where all papers will be displayed throughout the Congress. The deadline for the submission of abstracts is March 26, 2004. The deadline for the submission of full papers is April 14, 2004. (these deadlines are part of the Dertouzos awards paragraph and should be presented as such). The pre-Congress “e-business W@tch” forum: an EU imitative aimed at monitoring and analysing the rate and pattern of e-business take-up across Europe, particularly by SMEs. At present, 15 different sectors (e.g. food & beverages, publishing & printing, chemicals, telecommunications and computer related services, tourism, financial services) are being examined and the results on two of them will be announced in Athens, on May 18th. The pre-Congress Grid services forum, in collaboration with SEPE and the Greek Research & Technology Network (GRNET). Grids along with their challenges and perspectives remain a very hot issue for the research (e-Science), industry (e-Business, e-Industry) and potentially for the governments (e-Government). The forum, which will take place on May 18th, 2004, will address the issue of promoting the interaction and information exchange among the Industry and Research communities. The views of both on the future of the GRID services and the Openness of the solutions will be presented at the forum. WCIT 2004 will extensively cover some of the most cutting edge issues in Information Technology. Telecommunications and e-Government with additional services in R&D, consulting and marker analysis. The program is arranged around a different main theme for each day of the Congress and includes keynote speeches, plenary presentations and panel discussions designed so as to be informative, fast-paced and thought-provoking, so that those who attend come out with a clear vision of the immediate and far-reaching ICT future. DAY ONE: The ever-changing Telecommunications landscape will be the focus of the 1st Congress Day. The post-bubble, beyond-3G future, the applications that will drive it, the technology that will realize it, the new business models that will emerge from it, will be debated. The tone of the Congress will be set by opening keynotes from Howard S. Charney, CISCO Senior Vice President, Office of the President, Andy Green, BT Global Services CEO and BT Executive Board Member, Henning Kagermann, SAP Chairman & CEO, Sunil Bharti Mittal, BHARTI Enterprise Chairman and Managing Director, Nicholas Negroponte, MIT Media Lab Founding Chairman, Dr. Keiji Tachikawa, NTT DoCoMo President & CEO and Diego Visconti, ACCENTUIRE Group CEO Communications and Hi-Tec. DAY TWO: The second day will observe Information Technology’s dominant current and future trends and their impact on the world economy, as they matter now more than ever before in every organization’s bottom line. What are the best practices, winning architectures, and future developments that will deliver the best results? Keynote speakers include Robert Bishop, SGI Chairman and President, Michael Fromont, NEC Computers International B.V. President and CEO, Thomas Ganswindt, Siemens AG Member of the Managing Board and Siemens Information and Communication Networks Group President, Dr. Adrian Hammerstein, Fujitsu-Siemens Computers President & CEO, Sanjay Kumar, Computer Associates Chairman & CEO, Charles Phillips, ORACLE President of Sales, Marketing and Consulting and Maria Livanos Cattaui, International Chamber of Commerce Secretary General. DAY THREE: E-Democracy, beyond e-Government will be the last day’s theme. The two-way nature of Internet communications allows the citizens of local and global societies to voice their opinions in the most direct way possible since the days of the first Athenian democracy. What are governments doing now? What should they be doing? How is their role being redefined by technology? What will citizens demand from their governments? Anna Diamantopoulou, Greek Commissioner for Employment and Social Affairs to EU, José-Maria Figueres, Chairman of the UN ICT Task Force and Co-chief Executive Officer of the World Economic Forum, George A. Papandreou, former Minister of Foreign Affairs of Greece, and Arun Shourie, Minister of Communications and Information Technology and Minister of Disinvestment of India, will be among this day’s keynote speakers. Additionally, the Ministers from more than 25 countries will sign the “Declaration of Political Leaders on Technology Development in the Service of the Citizen”. In this day’s framework, the official launching of the access2democracy NGO will take place. 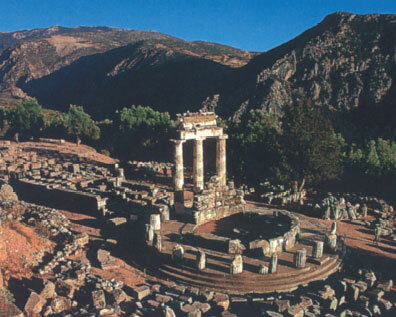 Mr. George A. Papandreou, member of the Honorary Board, will present the new forum and its mission. Access2democracy aims to enhance global democratic procedures through communications technology. The Congress will close with a tribute to the late Michael Dertouzos, Founder and Director of MIT’s famous Laboratory for Computer Science, with presentations from Victor Zue, current co-director of the MIT’s Computer Science and Artificial Intelligence Lab and Professor Ch. Halkias, Dean, Athens Information Technology, Greece. Michael Fromont, President and CEO of NEC Computers International B.V.
Keiji Tachikawa, President and CEO of NTT DoCoMo Inc.
Masaru Takabayashi, Director of IT, Honda Motor Co., Ltd.
Prof. Stephen Coleman, Internet Institute, Oxford University, U.K. The former Greek Minister of Foreign Affairs, Mr. George Papandreou, WCIT 2004 keynote speaker, has invited Ministers from over 25 countries to endorse the “Declaration of Political Leaders on Technological Development in the service of the citizen” on the third day of the Congress, Friday May 21st, 2004.